This quietly brilliant and intimate boutique hotel is the ideal option for those looking for something stylish, affordable and atmospheric (you won’t miss the morning call to prayer). Located in two adjoining townhouses in the heart of the historic Sultanahmet district, or Old Istanbul, Hotel Ibrahim Pasha is named after the most popular Grand Vizier (second in command to the Sultan) of the Ottoman Empire, whose next-door palace now houses the Turkish and Islamic Arts Museum. Like a chic private house, the hotel has 20 rooms, individually decorated with a mix of comfortable contemporary furniture, antiques and vibrant textiles. While standard rooms are fine, the deluxe rooms are noticeably more spacious, so it’s worth paying the extra. The hotel has no restaurant, but a good buffet breakfast is served in the lobby, which has comfortable sofas and two open fireplaces, and there are lots of great restaurants close at hand. One of the hotel’s best features is its guest-only roof terrace and bar overlooking the domes and minarets of the dramatic Blue Mosque, with the Sea of Marmara beyond. 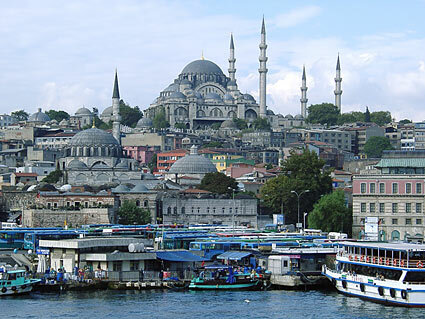 Istanbul is very old city with many beautiful mosques and old heritage buildings. It has some nice architectural hotels which give you feel of old times.